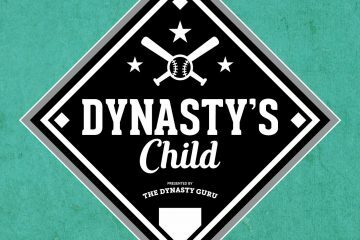 Since the publication of the 2018 Top 120 Fantasy Outfield Prospects, Part 1, Part 2, and Part 3, Spring Training and the first month of the season are in the books. Lewis Brinson, Miami Marlins. The Marlins named Brinson the leadoff hitter and starting centerfielder after a strong spring. Unfortunately, he did not carry his hot hitting into the regular season. In fact, over a 10 game stretch in April, Brinson went 1 for 36 with 15 strikeouts. When he does make contact, it is often on the ground (58%) and without authority (25.4% soft). The struggle is real, but the Marlins continue to trot Brinson out to center every day. Grade Change: hit tool decreases from 50 to 45. Jesse Winker, Cincinnati Reds. In a crowded Reds outfield, Winker carved out a sizeable role as the leadoff hitter against right-handed pitchers. Although no one will confuse him with Billy Hamilton, he continues to get on-base at a steady pace. Entering May, Winker boasts a .414 on-base percentage. Not only is he walking at his usually high rates (15.2%), but he is spraying line drives (32.8%) to all fields. The hit tool is impressive; now, he just needs to find his power stroke. Franchy Cordero, San Diego Padres. An early-season injury to Manuel Margot opened playing time for Cordero and he immediately took advantage. In his first game, he blasted a home run and, in just 67 at-bats, he has six total home runs. When he makes contact, it is loud as Cordero is 16th in exit velocity and hit the farthest home run (489 feet) of the season. The question moving forward is whether he will make enough contact (34.2 K%). Grade Change: power tool increases from 50 to 55. Harrison Bader, St. Louis Cardinals. Bader is a solid player, providing pop, speed, and defense. A stacked Cardinals outfield, however, relegates him to fourth outfielder status. If an injury opens playing time, Bader could surprise. Ronald Acuña Jr., Atlanta Braves. The mega-prospect, El Numero Uno, Acuña finally arrived! A slow start at Triple-A (.139/.244/.167 over his first nine games) and Preston Tucker’s solid placeholder performance briefly delayed his debut. Since Acuña arrived, he has been electric, with 4 doubles, a home run, and a stolen base in just 5 games. It should be a fun ride! Alex Verdugo, Los Angeles Dodgers. An injury to Yasiel Puig prompted the promotion of Verdugo. It is unclear if the move is permanent or only temporary. Considering Corey Seager is out for the season, causing Chris Taylor to shift to shortstop, Verdugo could seize semi-regular playing time across all three outfield positions. Regardless, he is a promising bat, with a potential plus hit tool and borderline average power. Austin Slater, San Francisco Giants. It took injuries to Hunter Pence and Mac Williamson for Slater to finally return to the majors. Last year, he performed well in his debut (.282/.339/.402). This year, Slater is off to a tremendous start in Triple-A, hitting .358/.435/.642 with 11 extra-base hits in 14 games. Hopefully, the Giants provide him an extended look. With borderline average or better tools across the board, Slater could be a solid fantasy contributor. Juan Soto, Washington Nationals. Last year in Low-A, Soto was on a tear (.360/.427/.523) before suffering a broken ankle on May 2nd. Subsequent injuries further derailed his promising season. Returning to Low-A this year, he picked up where he left off, destroying the level (.373/.486/.814) over 16 games. The Nationals quickly promoted Soto to High-A, where he has continued to impress (.269/.387/.500). Thus far, he has arguably been the most impressive player in the Minors, hitting for average, power, and discipline (15-to-19 strikeout-to-walk ratio). Tyler O’Neill, St. Louis Cardinals. Carnival sideshow strong man, O’Neill, blasted 6 home runs in an 11 game span to start the season in Triple-A. This power performance earned him a brief major league debut, in which he solely operated as a pinch hitter. Now back at Triple-A, he will need an injury or two to find regular playing time this year for the Cardinals. Seuly Matias, Kansas City Royals. After hitting 4 home runs in his first 3 games, Matias was an early season darling. Since then, he has hit 3 more home runs and continues to showcase his plus power. Regrettably, many forget Matias has an extremely unrefined hit tool, leading to a 28-to-3 strikeout-to-walk ratio. Of course, his early production is noteworthy, but proceed with caution. Grade Change: risk decreases from 30 to 35, moving Matias into the top 200 overall. Myles Straw, Houston Astros. Through April, Straw leads the Minors with 14 stolen bases, while hitting .361/.461/.458. A unique player, he hits for no power and purposefully drives the ball the other way most of the time (51.5%). 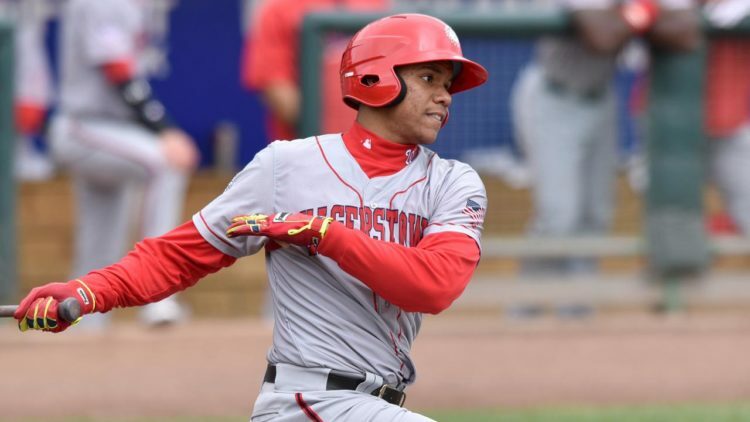 In an era in which stolen bases are becoming more and more rare, Straw could provide an excellent source of cheap speed if and when he receives a promotion. Anthony Alford, Toronto Blue Jays. Another year, another injury for Alford. A hamstring strain suffered in Spring Training delayed his start to the season. Since he returned, Alford has struggled, hitting just .222/.327/.267 with 18 strikeouts (34.6%) and 0-for-3 on the bases. Mickey Moniak, Philadelphia Phillies. Despite an unsightly second half last year in Low-A (.196/.234/.281), Moniak moves to High-A this year. Unsurprisingly, he continues to flounder, slashing .213/.228/.258 with a 22-to-2 strikeout-to-walk ratio. Although it is early, it may already be time to move on. Grade Change: hit tool decreases from 55 to 50 and power tool decreases from 40 to 35, dropping Moniak from the top 200 overall. Jhailyn Ortiz, Philadelphia Phillies. In his first taste of full-season ball, Ortiz is off to a rough start. Not only is he hitting just .158/.250/.246 with 25 strikeouts (39.1%), but he is now on the disabled list with a sore left shoulder. Ryan Cordell, Chicago White Sox. Forever a fantasy tease, Cordell possesses a dynamic power and speed package. Plagued by injuries throughout his career, he once more is on the shelf with a fractured clavicle. To add insult to injury, Cordell was atrocious in 10 Triple-A games before going down, hitting .132/.150/.184 with 17 strikeouts (41.5%). Victor Robles suffered hyperextended left elbow attempting a diving catch. Nevertheless, the injury likely sidelines him for several months. Luis Robert and Jose Siri are still recovering from thumb injuries suffered during Spring Training. Reportedly, Robert is still one month away from his full-season debut in High-A. After a strong start in Low-A (.283/.382/.457), Jo Adell is on the disabled list with a thumb injury. Kyle Lewis is on the road to recovery, playing games in extended Spring Training. Cristian Pache hit his first career home run on April 26th. Garrett Whitley is out for the season following right labrum surgery. A week into the season, Bryan Reynolds broke his hand, necessitating surgery. Reportedly, recent international signees, George Valera and Trent Deveaux, are drawing rave reviews in extended Spring Training. So far so good (and healthy) for Austin Meadows (.313/.380/.453) and Roman Quinn (.310/.372/.437 with 9 stolen bases). On Friday, the Monthly Prospect Update will explore pitching prospects. Stay tuned! I’ve added Capel, but also Buddy Reed. How about Shed Long BB% and K%? Think the Reds are seeing this once catcher as a potential big league debut this season? Maybe why Senzel didn’t see 2B for long? 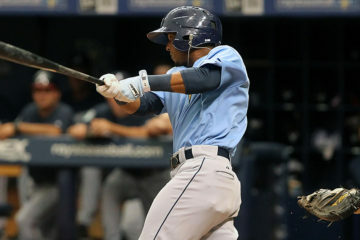 Dennis Santana and Jalen Beeks 2 kind of opposite prospects arms. Beeks supposedly redefined or did something to the cutter. I am quite high on Capel (2016 5th RD pick). He provides an intriguing blend of above-average power and speed. So far in High-A, he is hitting .322/.392/.467 with 7 doubles, 2 homers, and 9 stolen bases. Given his lofted swing, I imagine he will get to most of his raw power in games. Capel is also displaying improved discipline in the early going (16.7 K%/10.8 BB%). Reed is a different story (2016 2nd RD pick). Prior to this year, he struggled as a polished college bat in short season and Low-A. Thus far in High-A, he is showing off the plus wheels that got him drafted so high, with 14 stolen bases. He is also hitting for power with 5 homers already (.343/.375/.556). I am not sold on his hit or power tools. Both are well below-average for me, as partly evidenced by his 26-to-5 strikeout-to-walk ratio. Some of his early production is simply a small sample size fluke, but there is definite upside here. A 40/45 hit, 45/50 power, with double-plus speed is possible. He is a close follow. Long is off to a strong start in Double-A (.333/.413/.444 with 5 stolen bases). I doubt he will receive a promotion this year, especially with Senzel and Blandino both ahead of him and on the 40-man roster. I also do not think Long’s presence will have any impact on Senzel in the short-term. In fact, Senzel is back to playing 2B in Triple-A. Beeks will be discussed on the pitching prospect update coming out on Friday. Santana has a big arm (mid-90s fastball) and has been excellent so far, but command remains worrisome (8.6 BB% is manageable for now). What about Kyle Tucker? Houston isn’t getting much production out of Marisnick and Fisher. When do we see Tucker get called up? 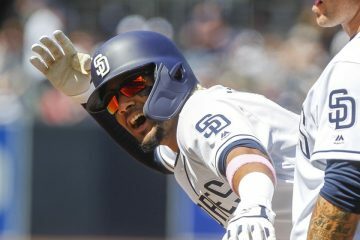 Tucker had an explosive Spring Training (.409/.438/.818 with 5 homers and 2 stolen bases) and is performing well as one of the youngest players in Triple-A (.278/.355/.433). Notably, he is creating a lot of hard contact (29.3% line drives). He is an easy top 10 prospect for me right now. Meanwhile, Marisnick has been atrocious at the plate (.154/.167/.323 with a 35-to-1 strikeout-to-walk ratio!) and lacks the range necessary for center. Fisher has been nearly as bad. I do not think the Astros have a center fielder on their roster, really. The problem is Tucker is not a center fielder either. In fact, he has 0 games played in center this year. I am not sure what the solution is for the Astros unless they call up Drew Ferguson (sleeper!) who can play CF and has a solid bat. With that said, I doubt Tucker will receive a promotion until June or July at the earliest. If the Astros wait that long, he likely will not fall within the Super 2 window for arbitration eligibility. Houston is loaded!! Tucker gets all the press, but how impressive has Yordan Alvarez been so far? He is a massive human being, has great strike zone judgement for a 20 year old, and seems to be learning how to lift the ball which is leading to more homers. And he is already in AA!! This kid could be a too 20 or top 10 prospect by seasons end! Alvarez just hit 2 more homers last night, raising his season line to .303/.394/.573 with 6 homers and 5 stolen bases. He has a truly special bat and enough range and athleticism despite his size (6’5″ 225) to play a corner outfield position. Ultimately, I do believe he ends up at 1B, especially with Gurriel aging and Gattis a FA after the year, maybe Alvarez is the starting 1B next year. Alvarez is certainly trending up and he is a comfortable top 50 prospect for me. franchy only gets moved from a 50 to a 55?! as of a week or so ago, only 34 batted balls have exceeded 115 mph, this year. Stanton has 6. Judge and Gallo each have 3. Franchy has 5?!? I know the hit tool is scary and will greatly reduce how much the raw power plays, in game, but come on. this has gotta be 60 grade power, at least. The power grade does not represent raw power, it represents game power. Does Cordero have plus raw power? Certainly. He probably has double-plus raw power. However, his hit tool causes it to play down. My grades are fantasy grades as well, not the same as scouting grades. A fantasy 55-power tool equates to 25-30 home runs or a .200 ISO. Cordero may have a fantasy 60-power tool, but the sample size is far too small to buy it just yet. He certainly has immense upside if he puts everything together.